This is the Photoshop action that I use for all my HDR images as well as regular photos. I developed this action to streamline my Photoshop post processing workflow. When played this action runs through my most commonly used layer adjustments, plugins and processing techniques to create a very sharp, smooth and polished image. Note: This action is included with “Secrets to Mastering HDR Photography” e-book. For those who already purchased the e-book, you should have received an e-mail with a download link. If not e-mail me your transaction ID using the contact page. This action will work with Photoshop Elements 7, 8 and 9 as well as Photoshop CS 3, 4 and 5. Note: Photoshop Elements 7 and CS3 users need to run action separately because “Play All Actions” won’t work with those versions. You will need 3 Topaz Plugins to play this action; Topaz Adjust, Topaz Denoise and Topaz Clean. However this action does include a non plug-in version that will work with both Elements and CS. The non plug-in version is included as a bonus. Results from this action is not comparable to the original version that requires the Topaz plugins. 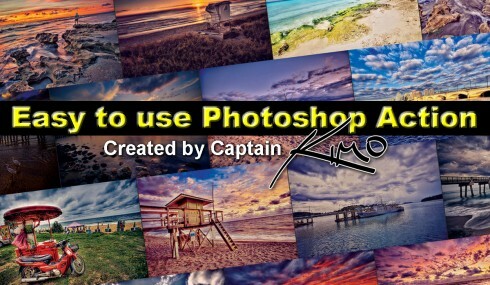 Check Out Some of Captain Kimo’s Before and After Images Below.